Joseph Stalin (1878-1953) was the dictatorial leader of the Soviet Union for a quarter of a century, from the late 1920s until his death in 1953. Stalin’s mistrust of Western governments, his insincere negotiations at the end of World War II and his determination to expand Soviet communism into eastern Europe were significant causes of the Cold War. Stalin was born Iosif Vissarionovich Dzhugashvili in the village of Gori, in what is now Georgia. His father Besarion, a shoemaker by trade, was a violent drunk who became a vagrant and was later killed in a brawl. A strong reader and capable student, Dzhugashvili won a scholarship to study for the priesthood. At his mother’s urging he entered the seminary, however, Dzhugashvili was more interested in left-wing political ideas than theology and religion. He dropped out of the seminary in and 1901 and joined the Social Democrats, a Russian Marxist group. In 1903 he aligned with Vladimir Lenin and the Bolsheviks, a radical faction who called for immediate socialist revolution. Stalin’s revolutionary career was a curious mix of activism, intellectualism and violence. His early contributions to the Bolshevik movement were raising funds through robbery, counterfeiting and extortion. Stalin was coarsely spoken, fond of swearing in his thick Georgian accent. He was also capable of thuggish violence, despite being short in stature (his height was 165 centimetres or five feet five inches). During this period Dzhugashvili began using several codenames, including one that stuck: Stalin (‘man of steel’). Stalin became a wanted man and was frequently arrested, exiled and imprisoned by tsarist authorities, only to escape. He was released from custody after the abdication of Russia’s Tsar Nicholas II in March 1917. Returning to the Russian capital Petrograd, Stalin became editor of Pravda, the Bolshevik party newspaper. When Lenin returned to Russia in April 1917, Stalin gave him loyal support. A second revolution in October 1917 swept Lenin and the Bolsheviks to power. Stalin participated in this uprising, though he did not have a significant role. Between October 1917 and 1923, Stalin served in several roles in Lenin’s government, most notably as Commissar of Nationalities. In April 1922 Stalin was appointed general secretary of the Communist Party of the Soviet Union (CPSU). It was an apparently mundane position, responsible for organising party membership, but Stalin used it to his advantage. Manipulating appointments and duties, Stalin was able to accumulate allies and influence while weakening support for his rivals. When Lenin was crippled by a series of strokes in 1922, Stalin kept him housebound and at arm’s length from other party leaders, while Stalin further increased his own power. After Lenin’s death in January 1924 Stalin isolated his main rivals for the Soviet leadership, particularly Leon Trotsky. By the end of 1927, Stalin had become the de facto leader of the Soviet Union. His rivals were either expelled from the CPSU or, in Trotsky’s case, forced into exile. 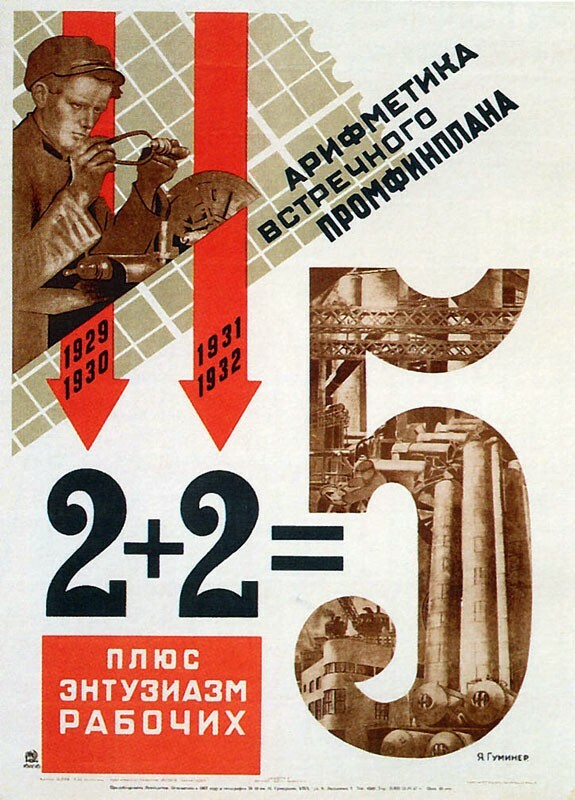 In the late 1920s, Stalin adopted the first of several Five Year Plans. These economic programs were designed to transform the Soviet Union into an industrial, technological and military superpower. Among his reforms were the forced collectivisation of small peasant holdings into gigantic, state-run farms called kolkhozy. Stalin’s reforms achieved their industrial goals but this came at enormous human cost; between 10-15 million Russians died from famine in the first decade of his rule. Stalin was ruthless in pursuing and eliminating threats to his power, both real or imagined. At various points in his rule, he initiated purges of his own inner circle, the CPSU hierarchy and Soviet military commanders. Stalin maintained an extensive and powerful secret police called the NKVD, a forerunner to the KGB; he would turn the NKVD onto anyone who raised his suspicions. During Stalin’s rule, thousands of Soviet citizens were subjected to investigation, intimidation, denunciation, show trials, torture or deportation to gulags (forced labour camps) in Siberia. Thousands more simply vanished, never to be heard from again. The West was well aware of Stalin’s dictatorial rule and the sufferings he inflicted on his own people. Many Western leaders loathed and feared Stalin as much as they did Adolf Hitler. This changed in June 1941, when Hitler’s sudden invasion of Russia forced the Allies to accept the Soviet Union as a wartime partner. The Soviet Red Army battled for almost four years to defeat the Nazis, a conflict Stalin labelled the Great Patriotic War. The Soviets lost around 11 million men in World War II, a cause not helped by Stalin’s brutal purges of experienced military officers in the 1930s. Despite these obstacles, the Red Army pushed the Nazis out of Soviet territory in mid-1944. By the first weeks of 1945 Soviet forces had liberated Hungary and were pushing into Poland; there they uncovered the Nazi death camps where millions of Jews had been slaughtered. Back home, Soviet state propaganda attributed these victories to the leadership and military genius of Stalin. 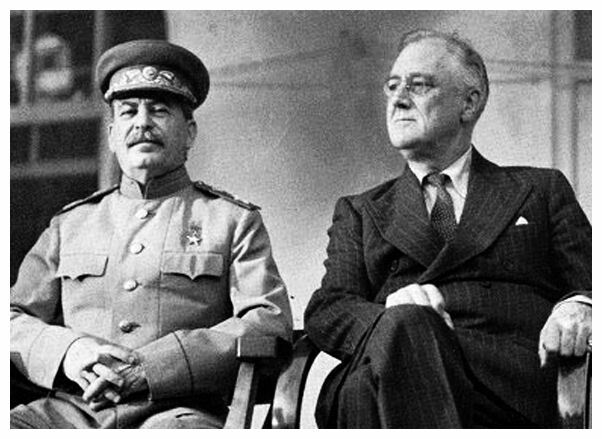 The uneasy alliance between Stalin and Western leaders fractured during the wartime conferences of 1945. While some dreamed of a continued post-war relationship between the Soviet Union and the West, Stalin believed the Allies would turn against him, once Hitler had been defeated. His aim was to expand Soviet territory into eastern Europe, to create a buffer to protect Russia from the Western powers. At Yalta and Potsdam, Stalin gave assurances to Allied leaders that he had no intention of keeping, such as promising free elections in Poland and other Soviet-occupied countries. On Stalin’s orders, the Red Army remained in these countries longer than needed. Soviet agents and local groups ensured the rise of socialist governments in East Germany, Poland, Hungary, Czechoslovakia and elsewhere. The communist leaders who emerged in these countries often modelled themselves on Stalin’s leadership and implemented Stalinist policies. Meanwhile, Stalin pushed Soviet scientists to research and develop atomic weapons. This process was aided by information provided by Soviet spies working in the US government. Stalin’s foreign policy became particularly belligerent in 1947-48. He refused the offer of American Marshall Plan aid and ordered that other Soviet bloc governments refuse it too. Stalin’s willingness to confront the West culminated in the Soviet blockade of western Berlin (June 1948-May 1949), a move considered the first major clash of the Cold War. Stalin’s foreign policy became less confrontational in 1949, due to the formation of NATO (April) and the first successful Soviet nuclear test (August). While Stalin maintained his anti-Western rhetoric and propaganda, he turned his attention to Asia, lending support to emerging socialist regimes in China and North Korea. Kim Il-sung’s invasion of South Korea (June 1950) was conducted with Stalin’s authorisation. In the West, Stalin became a figure of derision, a power-crazed dictator bent on expanding his empire while oppressing his own people. 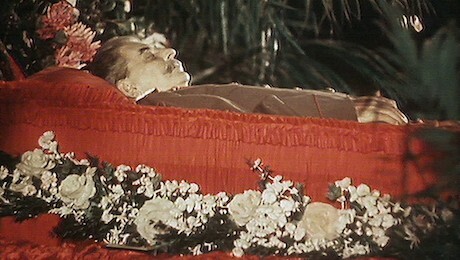 Stalin died in March 1953, four days after suffering a massive stroke. With no obvious successor, his death left the Soviet Union leaderless and the world uncertain about how the Cold War might evolve. 1. 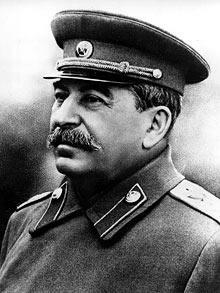 Joseph Stalin was the dictatorial leader of the Soviet Union, ruling from the mid-1920s until his death in 1953. His ideas and actions contributed to the unfolding Cold War. 2. Stalin’s origins were humble: he was born in Georgia, the son of a cobbler. After abandoning training for the priesthood he joined a socialist party led by Vladimir Lenin. 3. Stalin participated in the Russian Revolution of 1917, and in 1922 became general secretary of the Communist Party. This seemingly minor position allowed him to accumulate power. 4. After Lenin’s death, Stalin emerged as leader of the Soviet Union. Initially feared and detested in the West, he became a significant wartime ally after Nazi Germany invaded the USSR. 5. Paranoid about a Western attack on his country, Stalin sought to expand its territory at the end of World War II. This mistrust and expansionism, along with Stalin’s dishonest negotiation and belligerent rhetoric, laid the foundations for the Cold War. J. Llewellyn & S. Thompson, “Joseph Stalin”, Alpha History, accessed [today’s date], https://alphahistory.com/coldwar/joseph-stalin/.